Where to mount your nozzle? Why our nozzles are better? 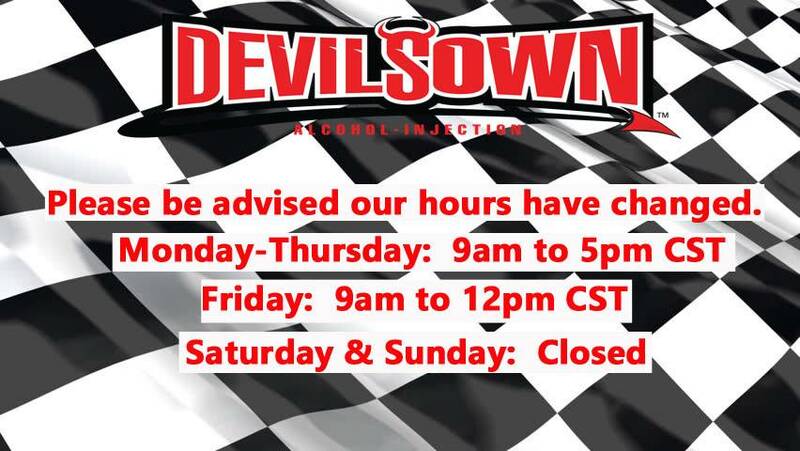 DevilsOwn© is the one-stop best source for your Methanol/Water Injection System needs. We offer a complete selection of parts and accessories at the best competitive prices around. From our tank tap adapter with incorporated filter, to our streamlined nozzle holder, each part in our system has been engineered to perform in the most strenuous conditions while maximizing the best output for vehicle. We offer a specifically designed 300psi internally bypassed pulse free pump to use with methanol/water injection. Our nozzles remain rust free and produce a razor-crisp 80 degree spray pattern. The DevilsOwn© Progressive Methanol Controller is the smallest and most reliable controller on the market. While other companies say they are the best, we don’t have to brag all over cyberspace. Out customers buy from us because our equipment consistently outperforms expectations and competition. The main function of water methanol injection is to prevent detonation. Detonation is produced by high temperatures and pressure developed in the combustion chamber. Water has a high latent heat content, which makes it extremely effective at preventing the onset of detonation. In addition, water injection reduces the production of NOx (oxides of nitrogen). Methanol, with its 116 octane and high flash point, additionally reduces the chances of detonation. While water is not combustible, it has a greater capacity to cool the intake air temps more than methanol alone. This is why we recommend a 50/50 mixture of distilled water and methanol. Methanol effectively increases the octane rating of the fuel, allowing performance gains when used in supercharged and turbocharged applications. How’s that for a science lesson? You hook it up, and you will see what facts and figures cannot describe adequately: a huge increase in your vehicle’s performance! You can verify the change because you know your vehicle better than anyone else. You won’t be disappointed. In fact you’ll be excited about your performance increases!